Sliding patio doors are perfect for connecting crowded living rooms to narrow decks or balconies. The panel glides easily, giving you a patio door that is both visually attractive and easy to operate. When the outdoor season kicks into high gear, nothing gets more wear and tear than your patio door. Thats why its important to know our finely crafted SureGlide doors slide smoothly on an exclusive system featuring an adjustable, 1 wheel. Our locking system creates a weatherproof seal with tight security. Best of all, our industry-leading warranty guarantees our doors will work effortlessly for life. Thanks to our Solid Frame Technology, our patio doors offer strength and durability, all at a surprisingly low cost. All SureGlide doors are tested against the toughest industry standards for air and water infiltration, wind load resistance, ease of operation, forced entry and more. Now you can create a high-quality, energy-efficient style for your home and still keep to your budget. A Door Designed to be Opened Time and Time Again. Extremely versatile, this dual sliding patio door opens from either side and is energy efficient for extreme climates. It slides easily and comes with a dual locking screen door and security lock on both doors. Maintenance-free internal blinds. Corrosion, rust and dent resistant. These mini blinds are incorporated into our factory sealed units. Once sealed these units are totally dust and maintenance free, offering a high level of control, convenience, privacy and durability while preserving the charm and clean appearance of your home's interior. PLEASE ALLOW 2-3 WEEKS FOR DELIVERY AS THE DOOR IS CUSTOM MADE. 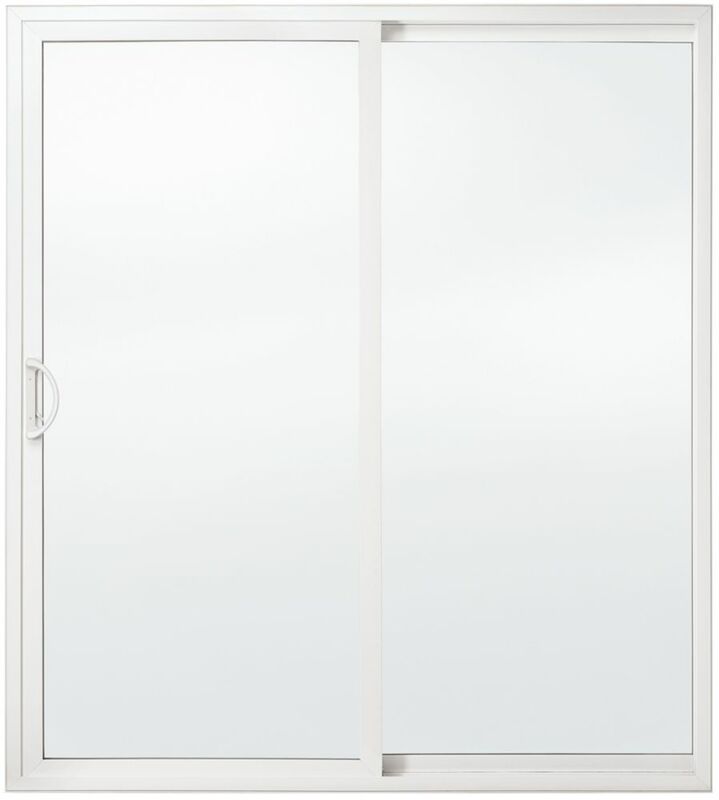 Extremely versatile, this dual White Interior, Black Exterior sliding patio door opens from either side and is energy efficient for extreme climates. It slides easily and comes with a dual locking screen door and security lock on both doors. Maintenance-free internal blinds, available in white only. Corrosion, rust and dent resistant. These mini blinds are incorporated into our factory sealed units and are available in white only. Once sealed these units are totally dust and maintenance free, offering a high level of control, convenience, privacy and durability while preserving the charm and clean appearance of your home's interior. PLEASE ALLOW 2-3 WEEKS FOR DELIVERY AS THE DOOR IS CUSTOM MADE. Premium Tripane, LowE, Energy Efficient, 5 ft. Vinyl Sliding Patio Door LH east - ENERGY STAR® The essential link between your indoor and outdoor living spaces, patio doors are the primary access points used by guests and inhabitants of the home to reach their decks, balconies, porches, and backyards.